The Bubbler Monitor is a state of the art microprocessor based instrument designed to monitor and control duplex air compressors in a level bubbler system. Duplex alternation of compressors assures even wear. Monitoring of individual compressor discharge pressure allows for a failed compressor to be removed from service and the unused compressor to be brought on-line ensuring a consistent air supply. A differential switch across the variable area flow meter checks for an unobstructed dip tube. 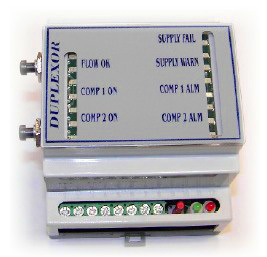 In the event of a dip tube blockage, the differential switch activates a flow fail LED and alarm output. LED indicators provide status of inputs and outputs. Compressor alternation is automatic on 4 hour cycle or on demand via side mount push button.